MoneyThing.com provides secured loans against assets such as property or vehicles. The parent company, Capital Mortgages Direct, has been running since 2004 but only launched its peer-to-peer site in November 2014. Investors receive between 10% and 13% per annum with loan-to-value between 60% and 80%. Borrowers pay rates as advertised from 1.5% per month, so the platform and its partners are sustained between lending at 1.5% per month and paying investors 1%. The platform is popular on the P2P independent forum and with investors: loan origination more than doubled in the first half of 2016 to £18,000,000. It is a manual investment platform: there’s no auto-bidding and you have to manually log in and bid on loans as they are released, generally at 4pm. Expected Returns: Typical rates of 12%. Provision Fund: No, but intermediary partners should cover all debt. Sell Out: Yes, fee free secondary market. Speed of Investment: Lots of opportunities but demand very high. You need to be quick. Innovative Finance ISA: No news. 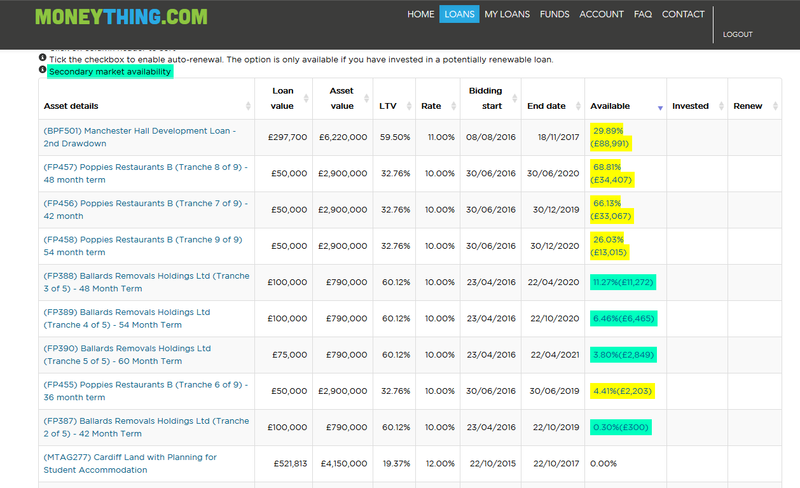 Existing loans which have just been released and are still funding are marked in yellow in the ‘available’ column. Loan-parts which are being resold on the secondary market are coloured in blue. There’s no penalty for listing your loan on the secondary market, nor sell out fees. While this is great under current circumstances of very high demand, if there were ever problems with many lenders trying to sell out at the same time there could be long queues. Deposit speeds for me have been under an hour in working hours, but not instant. As far as I can tell cash transfers are manually checked. Their FAQ page says it could take up to three days to process some deposits but this is probably a worst case scenario. However, in order to satisfy lender appetite it is designed to work with a number of partners. MoneyThing buys the loans from the Partner which are then assigned to MoneyThing under a Deed of Assignment. As part of ‘treating customers fairly’, each of the borrowers are sent a letter by the Partner informing them that their loan has been assigned to MoneyThing, however their relationship remains with the Partner from a redemption prospective. As part of the contractual relationship between the Partner & MoneyThing, the Partner commits to buy the loan back from MoneyThing in the event of default. Therefore, the lender is paid back the capital and final month’s interest payment at the end of the loan term. Whilst the borrowers may choose to renew the loan, the Partner still commits to buy back the loan from us and we may then buy that loan back again but only as a brand new loan. From the Partner’s prospective, they are using their existing loan book as collateral in order to raise finance from MoneyThing. Unfortunately, many asset finance companies (such as pawnbrokers), find is difficult to raise finance through traditional channels due to the perceived reputational risk and therefore many simply grow their business from reinvested profits only even though they often struggle to service the demand (particularly at the lower end of the market). As far as I can find there has been no direct loss to Money Thing investors. Some loans (those working with Broadoak Private Finance) also have a 5% holding on a first loss basis. This provides security for investors and shows the partner’s commitment to ensuring repayment. New loans are released at 4pm and those paying more than 10% go very quickly. The secondary market is extremely fast moving too and you’d be lucky to catch something from just logging in from time to time. Fortunately there is a simple trick that you can do to increase your chances of finding loan availability. Note: This method puts additional strain on the MoneyThing website and should not be over-used. If MoneyThing are seeing too many requests they could theoretically opt to block your IP address which would stop all access to the Money Thing website. 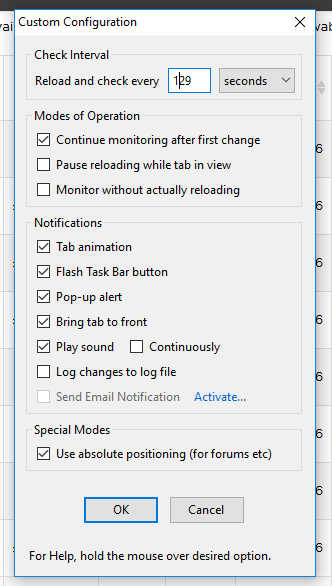 Install the Firefox web browser if you don’t have it already (link). 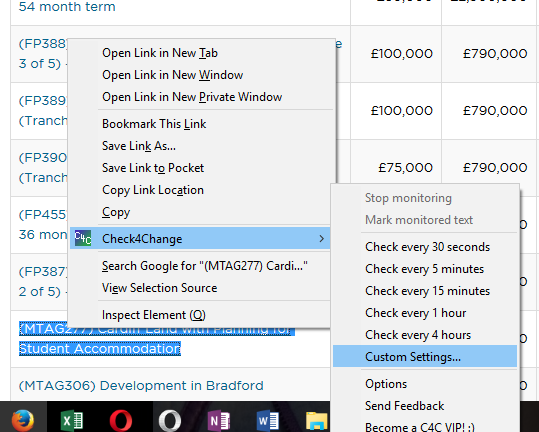 Install the Check4Change addon (link). Log into the MoneyThing website live loan page (link) and order loans by the ‘Available’ column, with highest availability first. The idea with this method is that if a new loan becomes available then that 0.00% loan you marked to check would no longer be in the same position (a new one would have moved above it). The first selection within the custom settings allows you to set a ‘check interval’ in seconds. If you set it as 30 seconds then the process will continually check for a change every 30 seconds. You don’t want to have this any more regular than 30 seconds or ongoing for more than a couple of hours or it would start to put excess strain on the MoneyThing website and could motivate them to start blocking abusive IP addresses. I really like MoneyThing. The rates are fantastic, there is a healthy secondary market to withdraw cash and the website itself is simple and fast. What I would be careful of before investing too much money is understanding the potential risk of problems with the intermediary partners such as Broadoak Private Finance and Cash Shop as you are not lending directly to the individuals themselves. You are an active investor in MoneyThing or have been in the last 6 months. Wondered if you have reviewed this site since their change of terms and conditions which have seriously shifted the balance of risk on to the lenders shoulders?